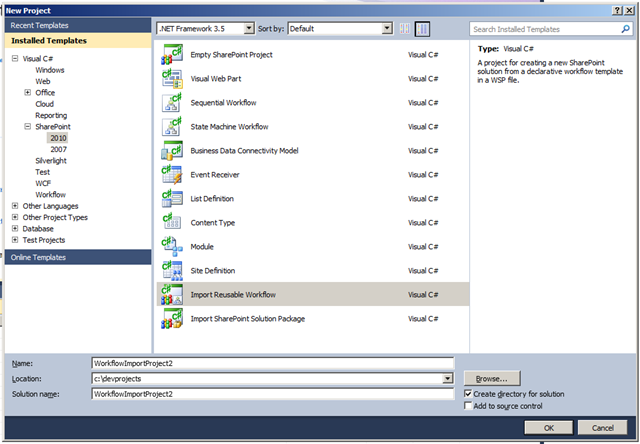 Another tidbit I wanted to share regarding SharePoint Designer 2010 that may be of interest to a lot of developers, site administrators, designers, and power users alike. 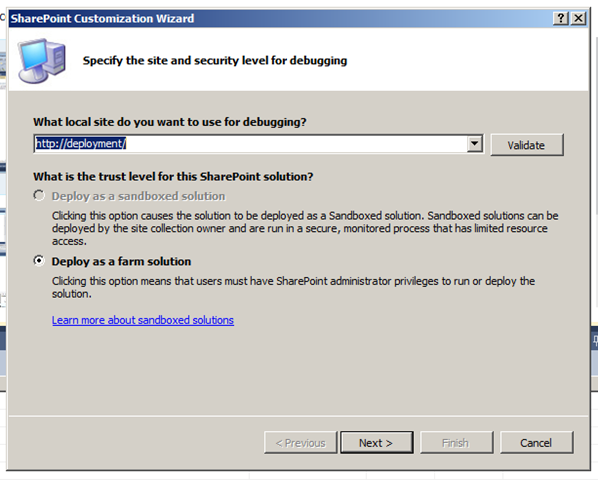 If you have the permissions, you now have options directly in the interface of SharePoint Designer, to save your web parts out to a local file, or, push it into the Site Gallery! 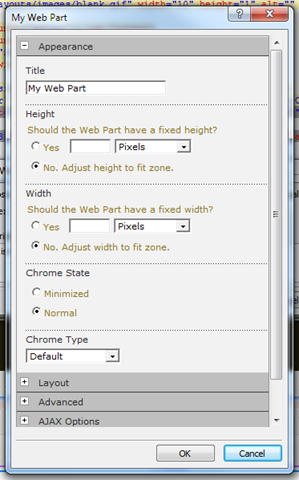 Then configure your web part as you’d like to… and from there in SharePoint Designer 2007, we were stuck with going back to the page which we placed this, using the chevron on the web part in Edit mode on the page, and then choosing Export from the menu. 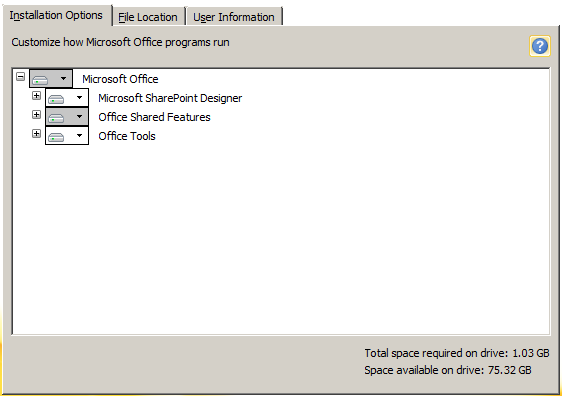 This is no longer with SharePoint Designer 2010! Once you have done that, if you look all the way over to the right of that ribbon tab, you will see a section called Save Web Part. As well as a Set Properties… button, which will allow you to set web part properties on the saved version of the web part before putting it into the gallery. This asks you if you want to always just show data from the current site list, tied to the List ID GUID, or, if you want to make it relative, which will tie it down to the list name itself, relative to the site in which it is displayed. 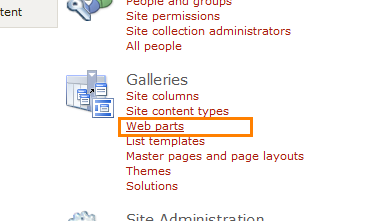 We will now see that our web part which we created in SPD 2010, is now deployed out to the Site Collection Web Part Gallery! If we choose the alternate option, To File from the Save Web Part section of the ribbon, you will be prompted to save it locally as expected. 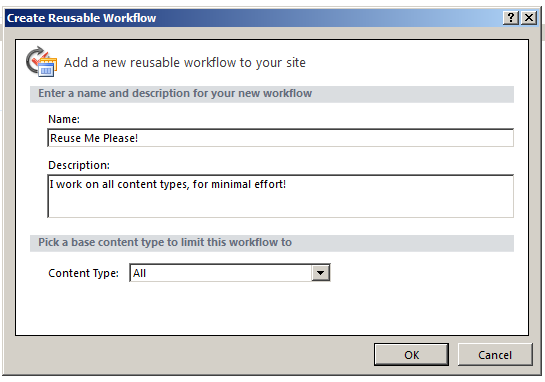 There is a lot of new functionality in SharePoint Designer 2010. As I get around to it, I’ll keep more of these posts coming. 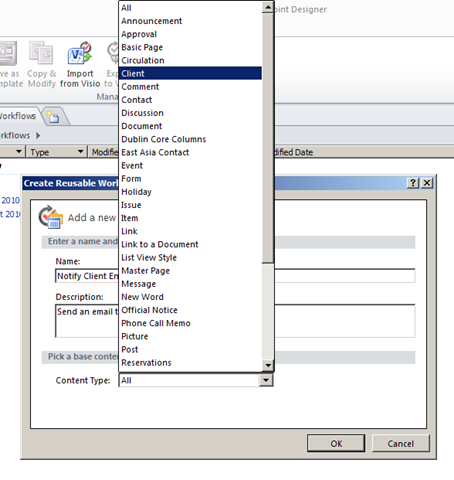 In my last article, Adding Custom Actions to the List Item Menu in SharePoint 2010 Using SharePoint Designer 2010, We walked through the process of adding custom actions to the List Item Menu using SharePoint Designer 2010, today, we’re going to have a look at the other Custom Action functionality available to us in SharePoint Designer 2010. 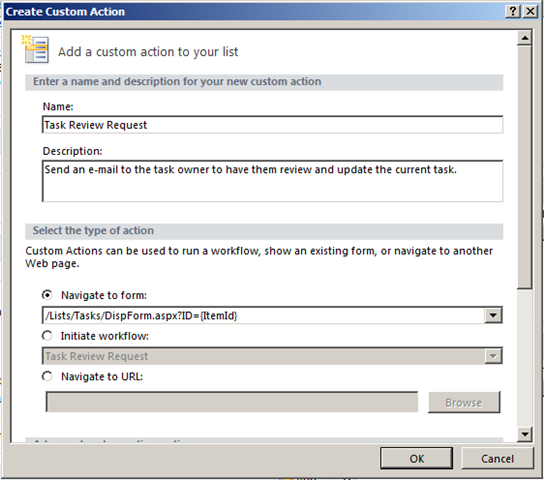 This article is going to group the rest of the options within our Custom Actions drop-down in SharePoint Designer 2010 together, as they are all basically doing the same thing, adding an item to the Ribbon UI, just for different forms (View, Edit, New, and Display). 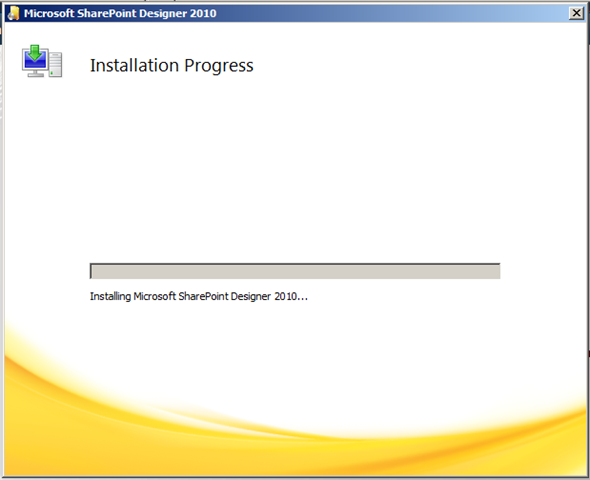 First, let’s open SharePoint Designer 2010 back up. 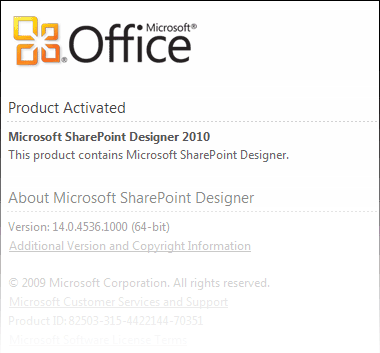 So, let’s go into our 2010 test site, and click on the Edit Site in SharePoint Designer action off of the Site Actions menu. 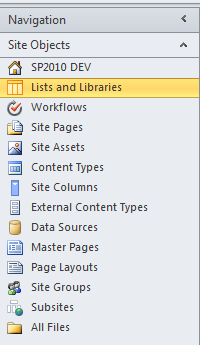 Now that we have SharePoint Designer open, click on Lists and Libraries, under the Navigation > Site Objects, area on the left-hand side of your window. 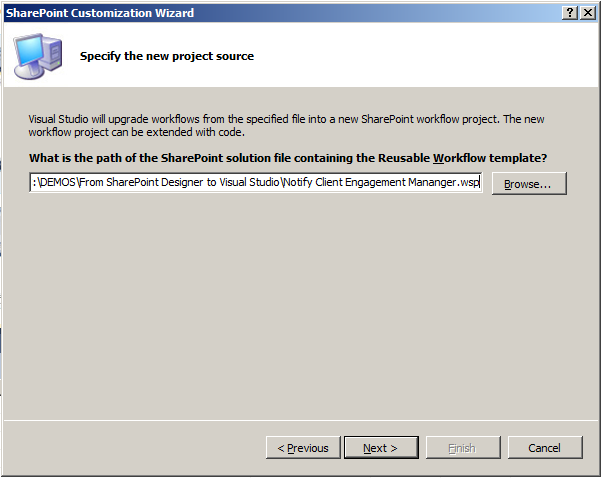 Here is a quick little tip while we are here as well, that is new in SharePoint Designer 2010. If you hover your cursor over Lists and Libraries, as well as any of the other Site Objects navigation options, you will see a thumbtack appear on the right. If you click on this, it will expand your Lists and Libraries, or any of the other options, below the Site Objects on the left-hand side, allowing you 2007-like left-side navigation navigation between your objects. 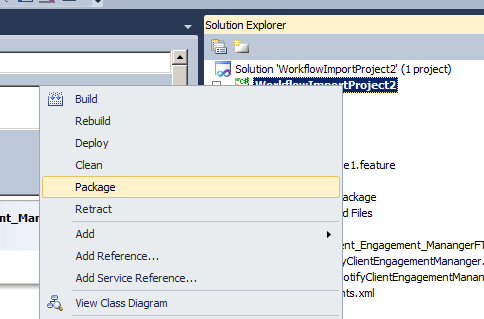 Now, on with the show… as I mentioned back towards the start of this article, we’re going to look at the remaining Custom Actions we can build into our lists from SharePoint Designer 2010. Click on any list that you have on the site. 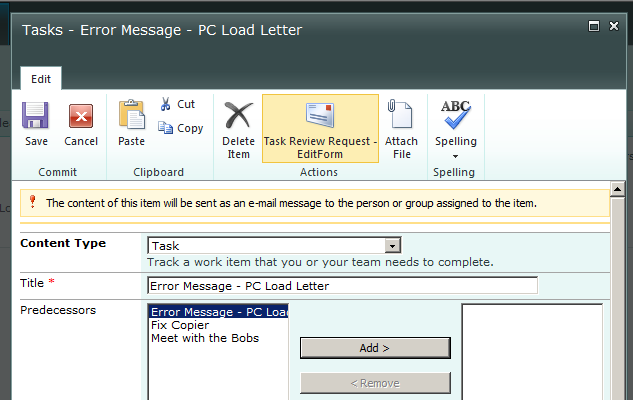 In this example, we will be using a tasks list that I had created for demonstration purposes. Now that we have our Tasks list loaded, we do not want to use the Custom Actions window in the lower-right hand side of our screen. 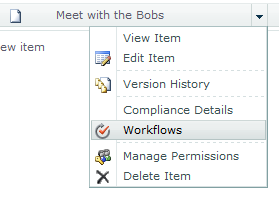 This will automatically create a Custom Action for the List Item Menu if we click on the New… button. No, to create other types of Custom Actions, we need to use the Custom Action menu in the Ribbon UI to do what we are looking to do. 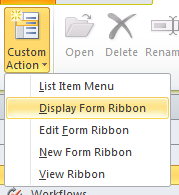 You will however notice, that by clicking here, the Ribbon context at the top of the screen changes from the List Settings ribbon, to the Custom Actions ribbon. By doing so, we see the familiar Create Custom Action window pop-up that we saw in my last article on the subject. For our example, lets fill in a Name, Description, and under the Select Type of Action, we are going to choose Initiate workflow. 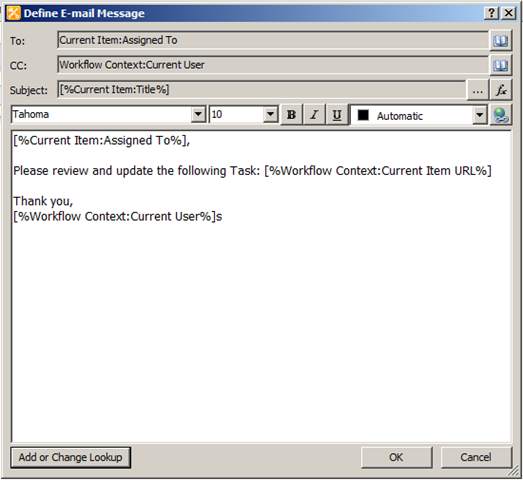 For this, I just created a simple list-level workflow, which will e-mail the owner of the task, CC’ing the current user, to request them to review and update the task, with a link back to the task (see screenshot below). 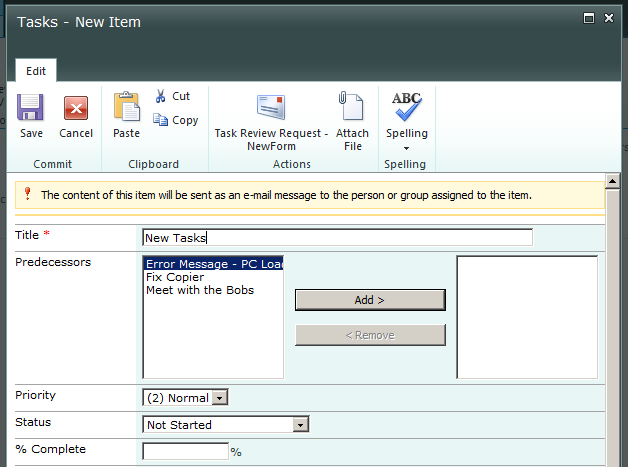 Select our workflow from the drop-down next, in this example, our workflow name is Task Review Request. Next, if we scroll down in our window, we are going to specify a 32×32 image, so that we have a fancy little icon to go with our button. We could sue a 16×16, but, that will be quite small, and since we’re on the ribbon, we want this to stick out a bit. 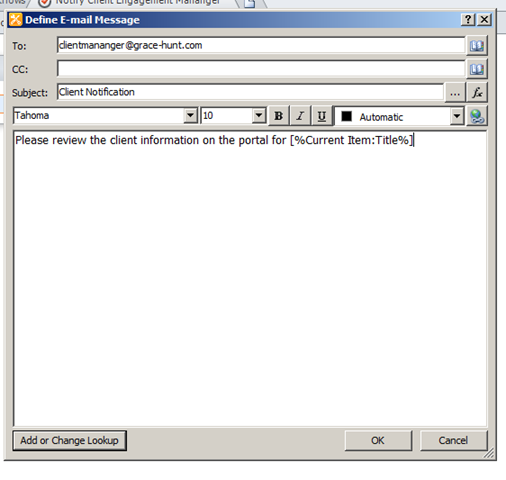 So, I browsed in the layouts folder in the SharePoint root to find an e-mail related icon, and did, at /_layouts/images/centraladmin_systemsettings_email_32x32.png. 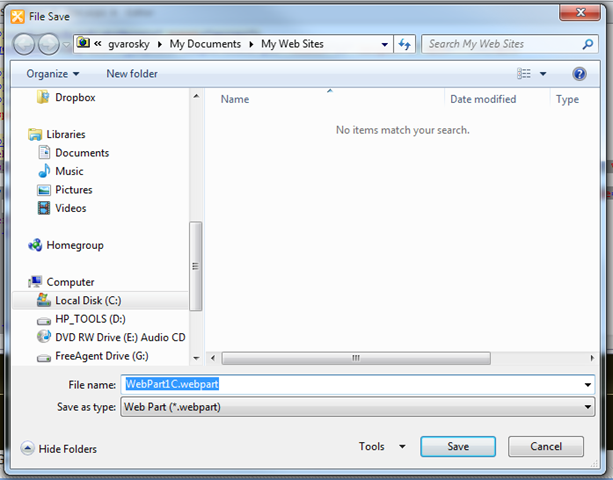 You could also use the Browse button to find a local image on your computer or network file share to use. Now, below there, there is the options for Rights mask. 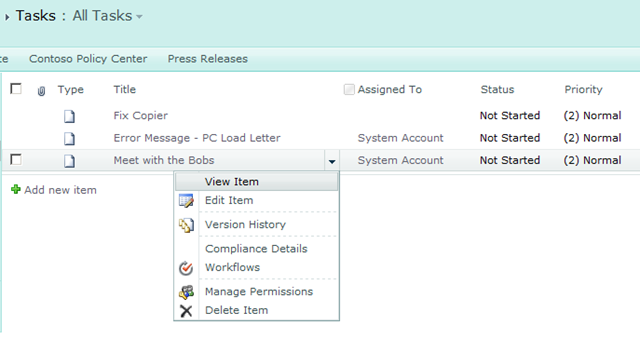 This allows you to assign permissions of who can actually see this custom action. 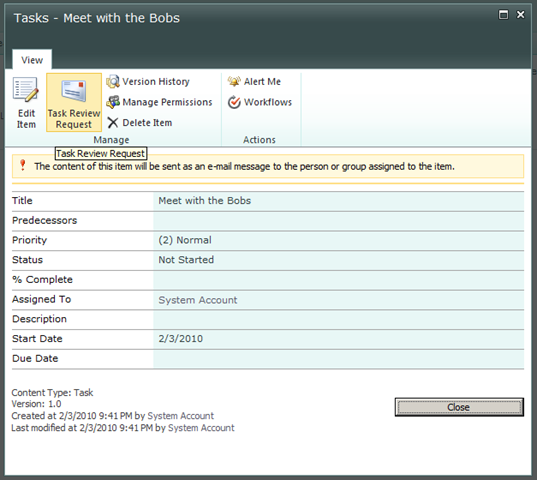 If the user does not meet the requirements, which are comma separated values from the SPBasePermissions class enumeration, they do not see the custom action. We will not apply any currently to this item, leaving it for all to see. But, the option is there. You can choose your own sequence number for this as well. Generally, the best practice is to use anything over 10,000. 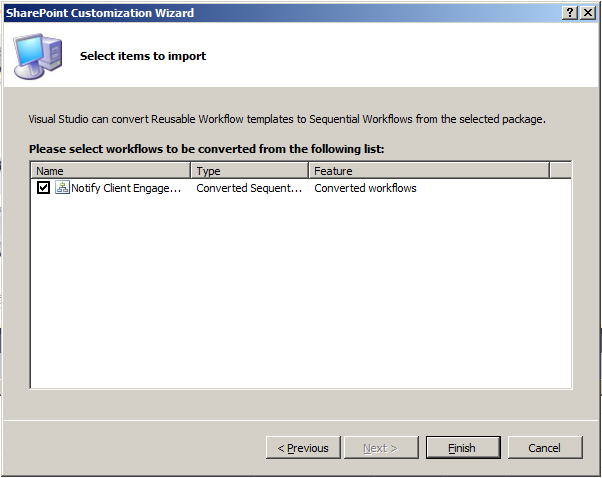 And once we click Start on the workflow initiation form, the workflow will then start! Very cool stuff. 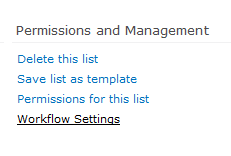 To be sure it is actually doing its thing, let’s check the workflows for that list item, back from the main list page, by selecting the Workflows option from the List Item Menu. Now, to finish up this article, we’re going to add the same Custom Action to the other forms on this site as well. 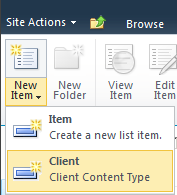 So, back in SharePoint Designer 2010, opened to our list, lets create a new Custom Action for each of the other three forms, and see where they show up. The only change we are going to make however, for each one, is just in the title. 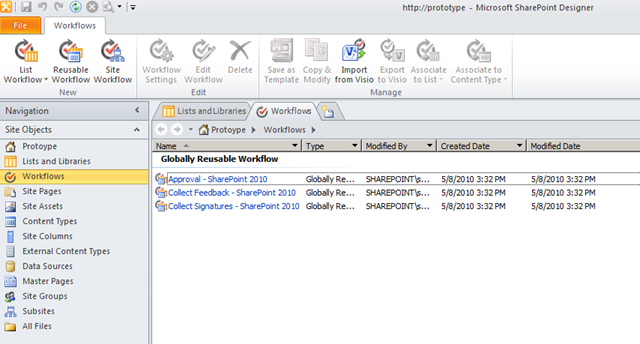 We could have it named the same thing for each form, sure, but, I want to show you where these end up in the SharePoint UI, and to do so, I am doing to insert the name of the form into our Custom Action title. 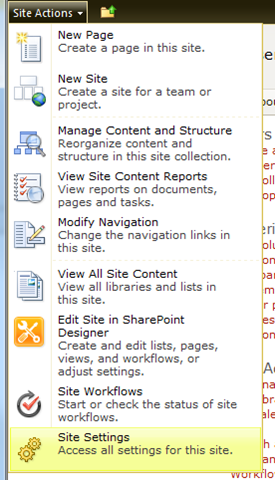 Now, let’s head back to our our SharePoint site and see where these now appear in the UI. 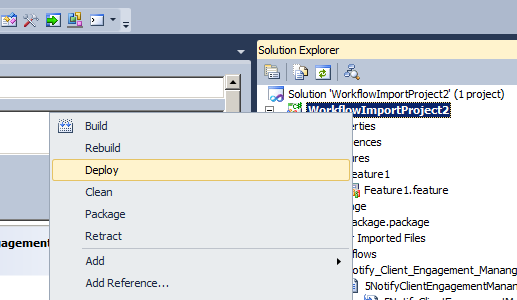 First – let’s have a look at the List View form ribbon – click on the Items tab under the List Tools ribbon , and you will see a section for Actions. You will also see in here, that our ViewForm Custom Action is available here. What does this allow us to do? 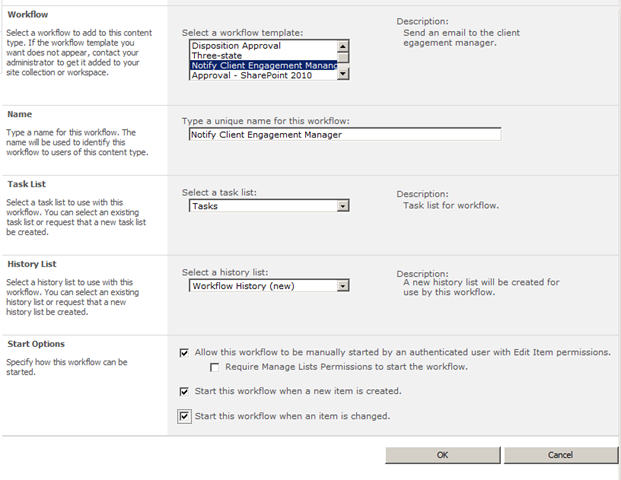 Well, using the multiple-item selection functionality in SharePoint 2010, we can run our action against multiple list items! Well, you would think… but if you attempt to do so, you will get an error, so, only do this on a per-item basis. 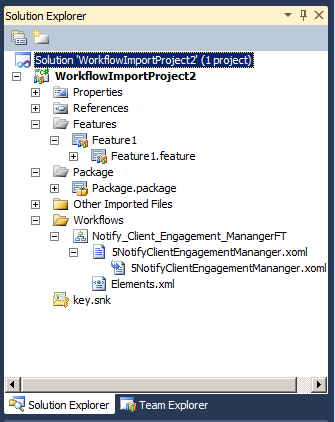 The functionality is not smart enough to fire up three consecutive workflows by using SharePoint Designer 2010 for each of the items you have selected. It will work fine when going through them one by one. 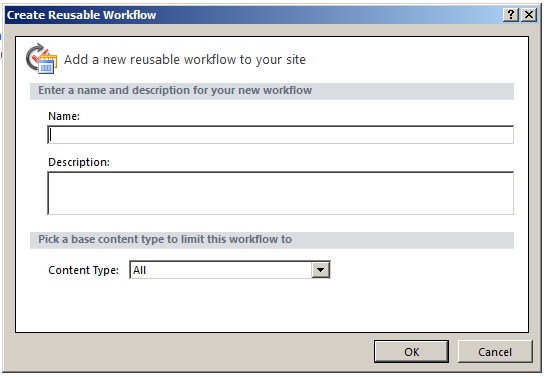 However, until the task is created, you will not be able to run the workflow, as until you hit Save on the new item form, your task does not exist as of yet, so, the workflow has nothing to bind to, just something to keep in mind when creating your Custom Actions in SharePoint Designer 2010. 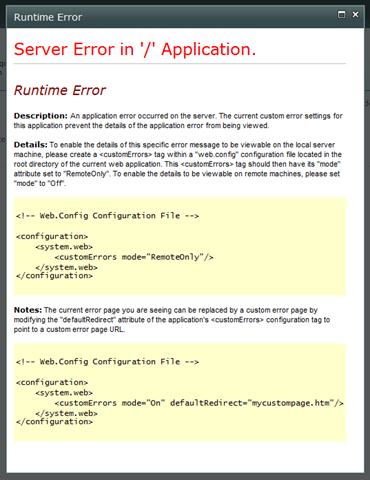 If you do try and run your workflow from your Custom Action – you will get the lovely Runtime Error. I just wanted to show you where this would appear, and that even though the Edit and New Forms use the same Ribbon Location (Ribbon.ListForm.Edit.Actions.Controls._children), they are actually bound to the individual forms themselves. 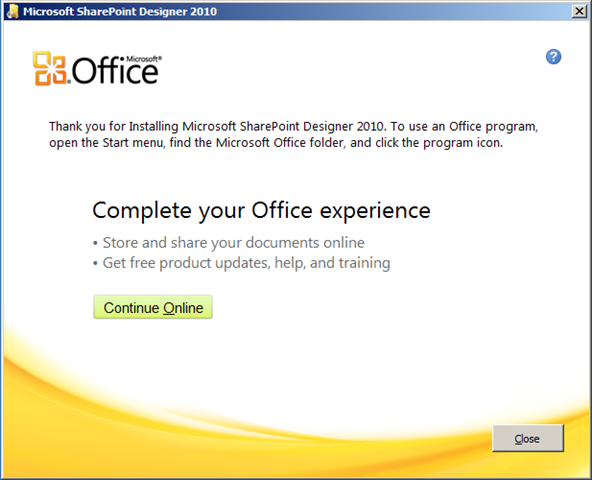 I hope this article was informative, and helps shed some light on some of the new functionality available in SharePoint 2010, and SharePoint Designer 2010. 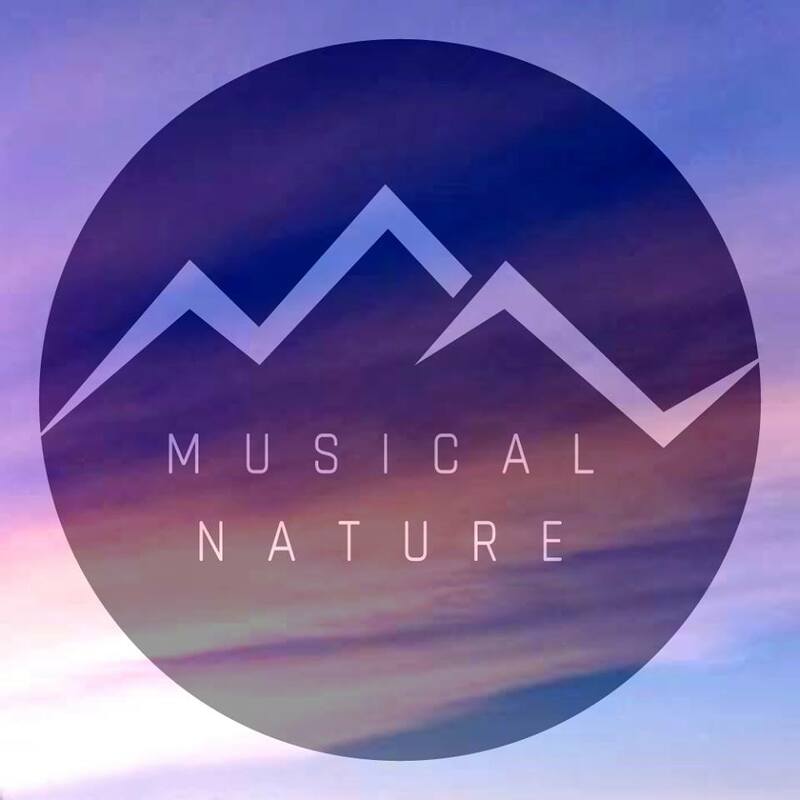 Please let me know what you think, or leave any questions regarding this material in the comments, and I will answer them as soon as I can. 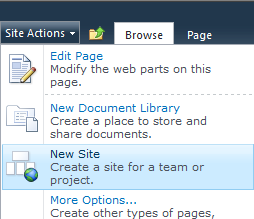 Almost daily, I am discovering new things with SharePoint 2010. Today, I was working away on my presentation for SharePoint Saturday NYC coming up in a few days, putting on the finishing touches, and, I came across this gem in SharePoint Designer 2010. Click it, go ahead, it’s not going to bite. 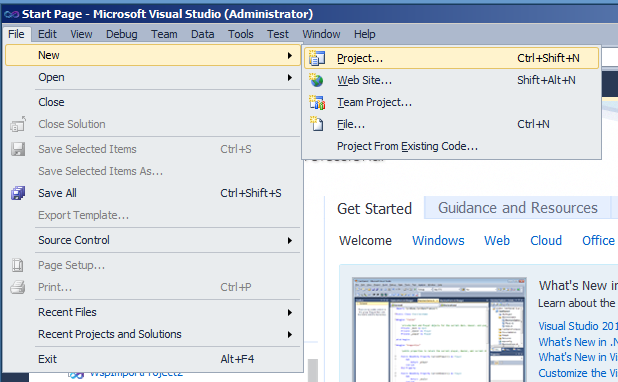 Now, the first tab you are opened to in this new window is labeled Parameters. What it should be labeled as however, is Property Bag. as that is exactly what it is. 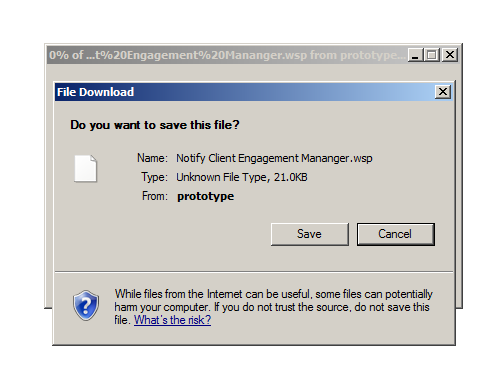 Once just a bucket for developers to play with, the property bag is now exposed in SharePoint Designer 2010. Which is awesome. Now, properties which you were storing there for your own use, can be extended out to Site Administrators, and Power Users to make use of! Awesome, yes. Also, dangerous. If you have applications which rely on the Property Bag, you have now been warned. Others can access, change, view, and delete the data within the property bag. 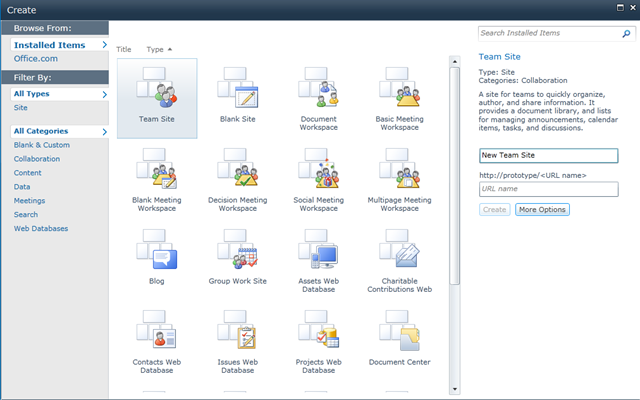 SharePoint Designer is an invaluable tool for site administrators and developers within SharePoint. After the Microsoft SharePoint Conference in Las Vegas, and seeing all of the great things that Microsoft has done to improve this tool from its humble beginnings back when it was FrontPage. 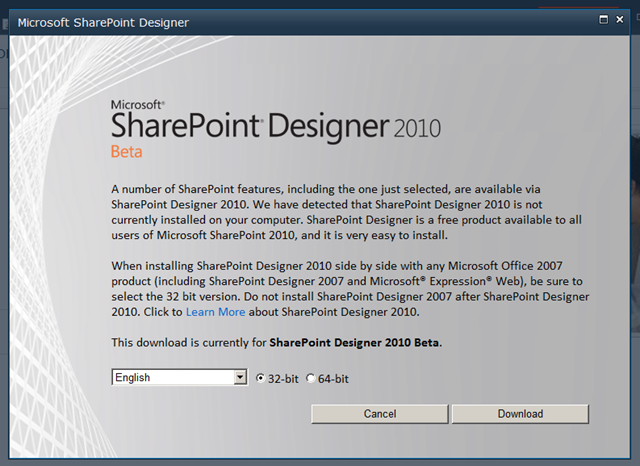 So, naturally that I now have full-on access to the 2010 Beta, I am anxious to start playing around with SharePoint Designer 2010 first hand. The first step in this process of course, is to get it installed. To do so, I am starting from the first site I have created in my new environment. 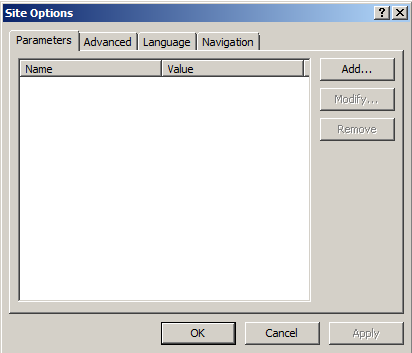 Since I do not already have Designer 2010 installed, a dialog window pops up, basically letting me know that I do not have it installed, and I can do so. 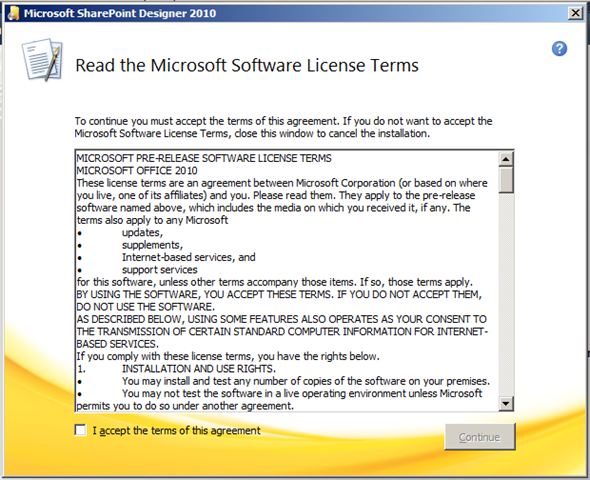 Just like SharePoint Designer 2007, SharePoint Designer 2010 will be free for all users. And since the Beta is all that is around now, that’s what it will install for me. 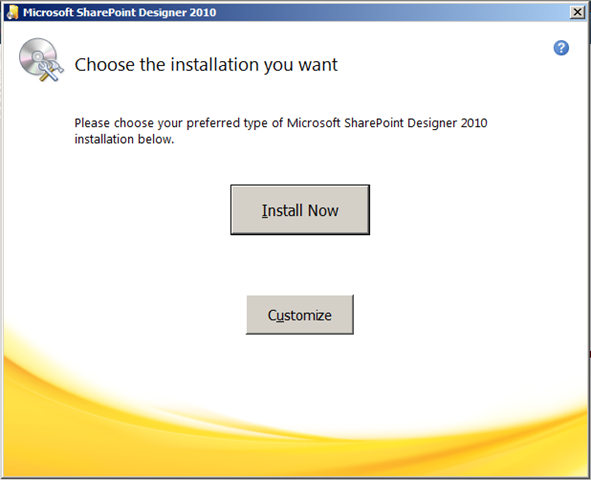 I select the language I am looking to install SharePoint Designer in (English, German, Spanish, Japanese, French, Russian, and Chinese are other available languages that can be selected, in addition to English, as shown above), and choose my platform. 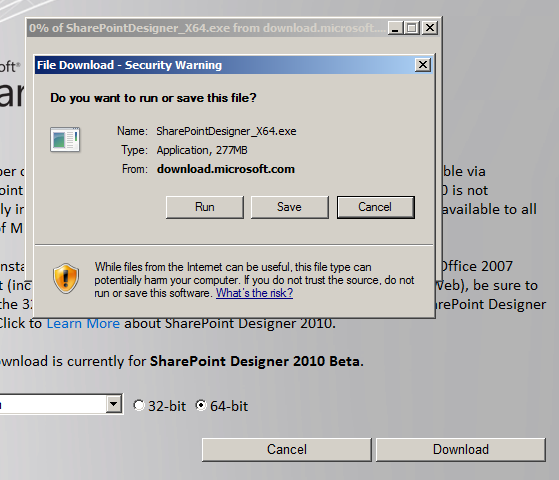 Even though SharePoint 2010 is only 64-bit, SharePoint Designer 2010 is available in both 32 and 64 bit, as it is intended to be run from the desktop, and many of us still run 32 bit desktops, as we probably will for a long time to come. Once done, selecting the Download button goes out and fetches the right download, and prompts me to run and/or save it. It’s sizeable for my options as chosen (English 64-bit) at 277MB, happy that I have a nice and fast connection. 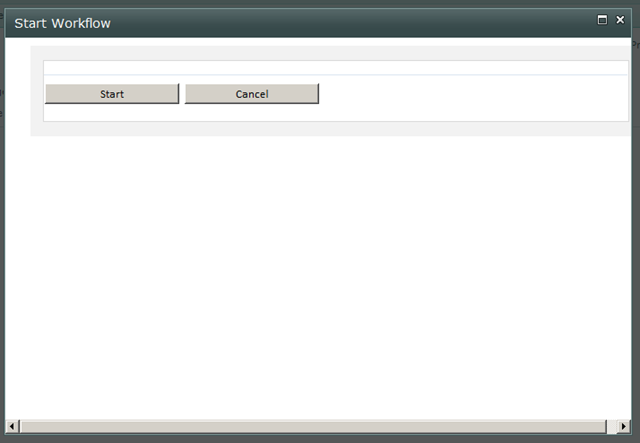 Once it’s up and running, the installer will extract the files, and then move on. Once accepted, you really cannot miss what is needed on the next screen. Microsoft made sure of that. The installation begins (of course after you have clicked the Install Now button.